Last night, I attended Gateshead's planning committee where a decision was to be taken on whether or not to allow in principle up to six houses to be built on Chase Park, Whickham. I will discuss that issue on another post. I am not a member of the committee but was there to film this section of the agenda. In the meantime, let us look instead at the claims of someone else who attended the meeting: Labour's Cllr Chris McHugh. Cllr McHugh, head of office for Blaydon MP Liz Twist, raised objections to my filming the meeting after the vote was taken on the planning proposals. He seems to have overlooked the fact that filming council meetings is a democratic right enshrined in law. He was told by one of the officers that anyone can film a meeting. Cllr McHugh concluded that I should have informed the chairman in advance. As it turns out, just before the start of the meeting I chatted to the chairman about various pleasantries. I said nothing about filming the meeting but since I was standing next to him holding a video camera and a very large and obvious tripod while engaging him in conversation, explaining that I was there to record proceedings was somewhat unnecessary. 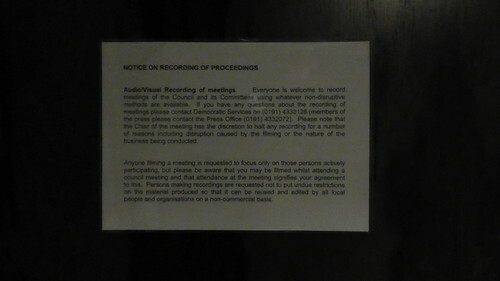 Interestingly, a notice on the door to the meeting (see above) states that people are welcome to record the meeting. Nothing about needing to inform the chairman in advance! Perhaps Cllr McHugh should read what is in front of him before he wastes people's time with his whinging. And so we move on to this morning and Cllr McHugh has had time to come up with another silly claim to deflect attention from what he had done over the Chase Park proposals. This time he splashes a claim across residents' Facebook sites that I was somehow "secretly" recording the meeting! The deflection attempt failed. There are countless comments by residents unhappy with his support for the Chase Park proposals. But a thank you to Chris is appropriate - thank you for giving us a new story about Labour being unhappy about opening up the council to democratic scrutiny by giving residents the opportunity to see elected representatives in action through the medium of video.